Indonesia #1 haven for entrepreneurs? Can this be true? 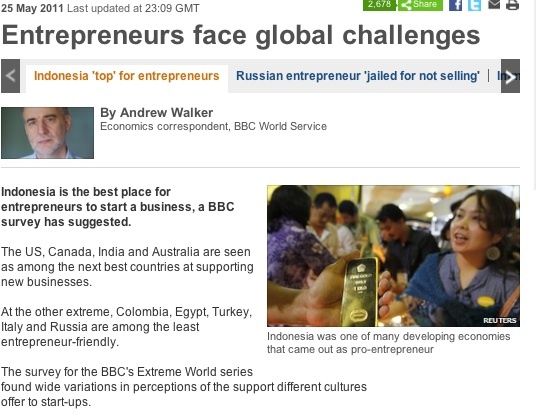 Can Indonesia, where conventional wisdom says is a difficult market to operate because businesses have to cut through all that red tape and corruption just to get simple tasks done, be a haven for entrepreneurs, as this BBC survey suggests? To be clear the survey only asked entrepreneurs who were already operating in their markets. so its more that the insiders think about their markets. Indonesia came up on top of the survey, which was conducted for the BBC World Service by the international survey firm Globescan together with the Program on International Policy Attitudes at the University of Maryland. How reliable is this? Can it be that Indonesia is really entrepreneur friendly? Unspun thinks you could plit hairs about the methodology of the poll, the sample size, who was actually being polled but from Unspun’s personal experience as a businessperson/entrepreneur, having launched Maverick in 2002 and growing it till now (see this posting for our ninth anniversary) is that the survey may be right. 1. Is innovation highly valued in this country? High is, of course, a relative term but our experience is that Indonesian clients are open enough to try newer things. One of the innovations we had was to design an interactive role playing module from the time-honored media training modules that every PR firm offers that we call Hacks and Flacks. We made it fun, reversed roles between spokespersons and reporters and set them about discovering what are the differences and similarities between the two groups. The module has proved popular and we now use it for about 60 percent of our media training requests. Clients have similarly been welcoming when we started our new media consultancy and also when we experimented with Twitter games during a social media training session for a bank, usually one of the most conservative of institutions. The trtaining went so well that the bank is now considering integrating Twitter as part of its customer service. Not innovative by global standards but by Indonesian and even regional standards that’s pretty advanced stuff. Unspun has a difficult time imagining how banks in neighboring countries like malaysia and Singapore would embrace social media the way the Indonesian bank plans to. 2. Was hard for people like us to start a business? Who’s us? I would define us as fairly honest and straight professionals turned entrepreneurs. Apart from the usual facilitator fees we are not very courageous nor have the inclination to bribe our way into contracts and favors. We also do not have high level contacts and cronies in high places. So because of these “shortcomings” we are forced to live by our wits, to outthink and outperform our better endowed competitiors. The fact that we have managed not only to survive but to prosper modestly for nine years, building up a stable of clients that are blue-chip multinationals, and growing from 6 to 60 people in the process, is proof positive that while Indonesia is not the easiest of places to do business, it is not that hard either. In fact, whenever we look back we are amazed by how smooth things have gone. We received only minimal hassling from the government agencies, and even that has reduced because of a slow but constant professionalization within its ranks; our clients pay on time, surprising overseas guests that have this impression that Indonesians are recalcitrant debtors; and we love out clients (we constantly and steadily get rid of those we do not like). 3. whether people who innovate are highly valued? Yes, and not only that, even people who are good at marketing themselves as innovators, but aren’t are valued. This is an open market place, a bit undeveloped, in constant churn. Those who can innovate and who can sell the ideas come out on top. And they get lots of money. Just look at the activities of the so-called buzzers – the Twitterers who have accumulated a vast following and leveraging them as endorsers and influencers – for an idea of how innovators are valued. 4. whether people with good ideas could usually put them into practice? Yes, and answered in the questions above. These are some of the reasons why Unspun loves Indonesia as a place to do business. The opportunities are so huge and the competition is not that much, someone who can come in with a clear strategic direction and impeccable executional capability is sure to make a killing. So what are you waiting for entrepreneurs of the world. Come to Indonesia. You have nothing to lose but your existing tired, dull markets. A heartwarming story about doing business in Indonesia. We will be taking the deep-dive into Indonesian enterpreneurship as an interactive agency next year and this story confirms my strong feelings. If you say what you do and do what you say and be professional about it, clients will recognise this and stick with you. (Doing great business is not so different across the globe as you might think, I believe). Coffins delivered to your doorstep: effective viral campaign or bad taste?